1 - I have an imaginary cat named Simon. Some people think he's real because I write about him here on the blog from time to time. 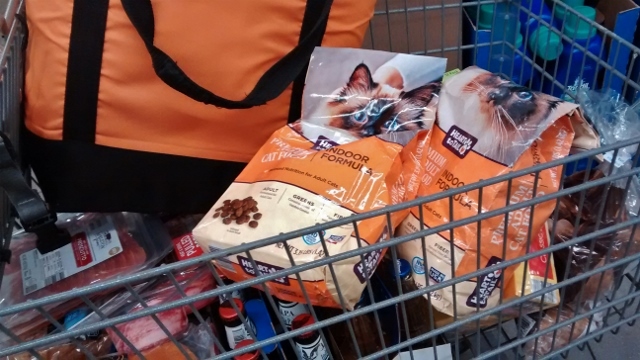 2 - So if my cat is imaginary, why am I shopping for cat food? 3 - If I was a cat, I think I'd prefer crunchy nuggets over soft food. The soft food stinks. Although maybe if I was a cat, I would think it smells divine. You know what's great about Facebook? It's chock full of distractions! Wait a minute. . .maybe that's not such a great thing. I should be focused on boat projects and writing projects. Instead I find myself discovering new sites and rabbit holes to waste time on. 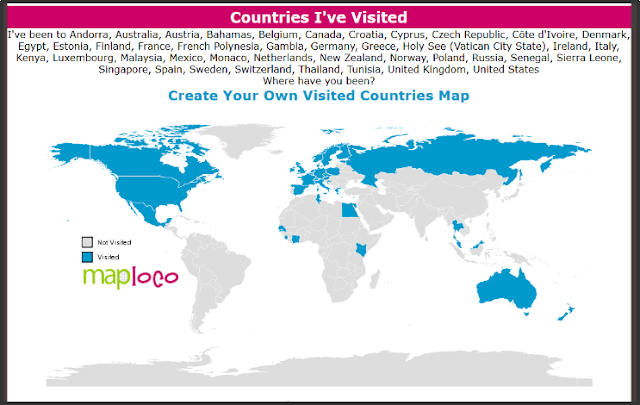 Like MapLoco's cool site where you can make maps of all the places you've visited. You can fill them out for US states, Canadian provinces, European countries, or worldwide. I couldn't remember what states I've been to, so I filled out the worldwide map instead. In my defense, I only spent about ten minutes doing it, so it wasn't too much of a distraction. But then I ended up daydreaming about places I want to visit for a good three hours, so that was pretty distracting. I'm thinking we need to set our sights on filling in the blank parts of the map. There's a lot of countries left to visit. Do you like to travel? What's the most interesting place you've visited? Where do you want to travel to next? 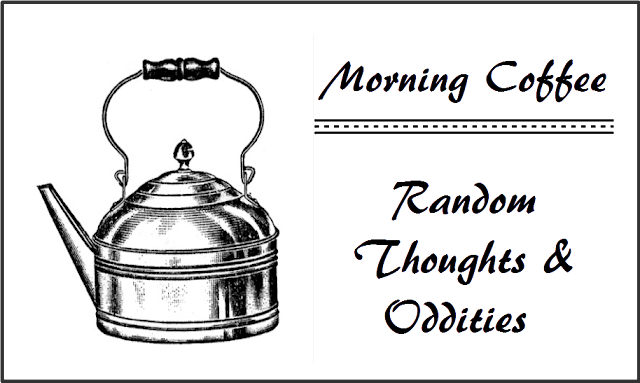 In addition to the usual blog posts on Mondays and Wednesdays (and the occasional Friday) about life on a sailboat and other oddities, I also occasionally post on Saturdays, focusing on things related to writing such as cover reveals, book launches, reviews, interviews with authors etc. So if you're a bit of a book nerd like I am, check in on Saturdays - you never know what might pop up. 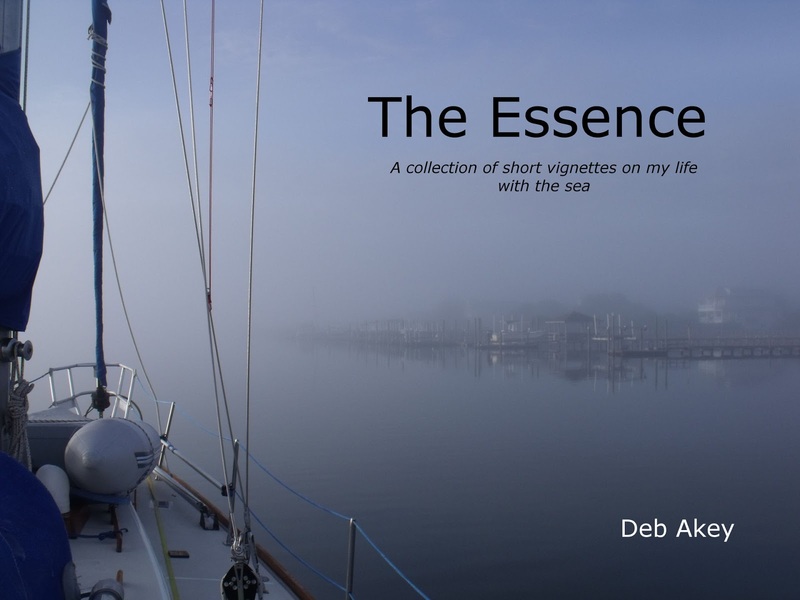 Today, I'm featuring Deb Akey's wonderful book, >>The Essence: Short Vignettes on Moments that Define my Life with the Sea<<. I found The Essence to be a really unique book full of beautiful photographs accompanied by short vignettes about the author's reflections of her life living on a boat and her relationship with the sea. Deb has a lovely way with words - her honesty, sense of adventure, and wonder and curiosity about the world shine through. Deb dreamed of escaping a life of unsatisfying work by selling everything and sailing off into the sunset. It's the kind of dream many people have, but few actually achieve. This book explores the "why" behind that decision - what compelled her to live a meaningful life with the sea. Perhaps one of my favorite vignettes was the one which described the parade of boats that heads down the Intracoastal Waterway each year to Florida and beyond. 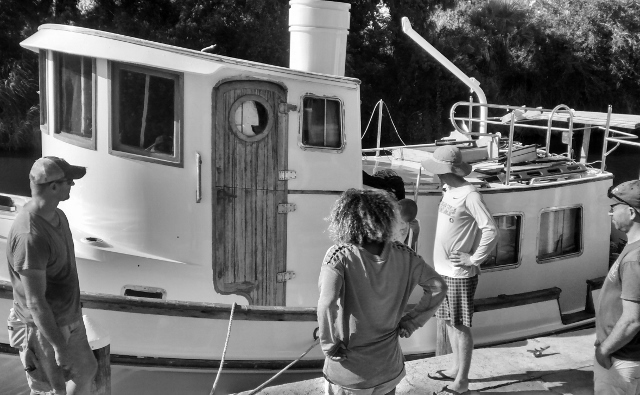 I loved Deb's curiosity as she passed each boat, trying to imagine everyone's backstories and what led them to this life on the water. "As we pass each boat, I like to imagine the story of the person manning the helm who waves. Was she a corporate manager? Was he an accountant? Do they have eleven grand kids like we do that makes it hard to leave? Did someone break his heart and he's seeking solace in the quiet of the water? Did she suddenly realize, while doing a load of laundry, that life was passing her by?" As I turned each page, gazed at the next photograph, and absorbed Deb's words that the image sparked for her, I found myself reflecting on my own life choices and search for meaning. And that's what makes this book so special from my perspective. Deb shares her thoughts, but they're just a springboard for your own contemplation and meditations. You don't need to be interested in sailing or cruising for this book to resonate. It's about common human experiences - major life changes and their consequences, the importance of family, fear of the unknown, chasing your dreams, and our connection to nature. You can pick up a copy of >>The Essence<< on Amazon in both ebook and paperback format. 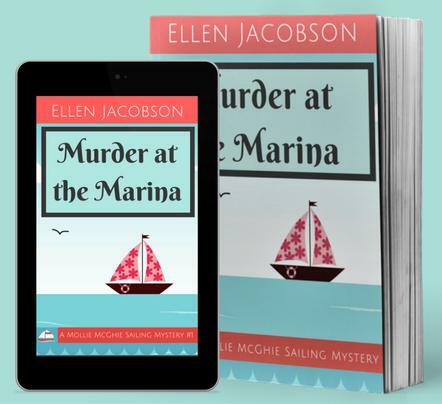 I think that it would make a wonderful gift for someone who is thinking about the cruising lifestyle, for friends and family of cruisers to give them an insight into what life on the water is like, or for anyone who is curious about one woman's experiences living a life connected to the sea. Deb Akey is a former pilot, motorcyclist, and computer guru. In 2013 she and her husband T.J. sold everything, moved onto their 42-ft sailboat and left to cruise the East Coast and Caribbean waters. Deb also writes children's books under the pen name Dema, a name given to her affectionately by her nine grandchildren. 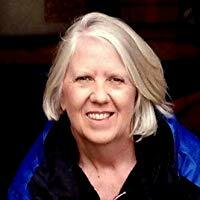 She is currently working on book two of the Maryssa Mayberry series, a series of children's books which deal with the ocean and how we can all help to sustain its viability for many centuries to come. Deb and her husband spend much of their time writing about their experiences on their blog, The Retirement Project. They have also written a indispensable guide for anyone thinking about buying a cruising boat, >>How NOT to Buy a Cruising Boat<<, in order to help others with the dream of cruising succeed. NOTE: I was given an advance reader's copy (ARC) of The Essence by the author and voluntarily chose to write an honest review. When you think about the sea, what comes to mind? Are you going to pick up a copy of Deb's book? 1 - I love getting packages in the mail, especially when they're a complete surprise. 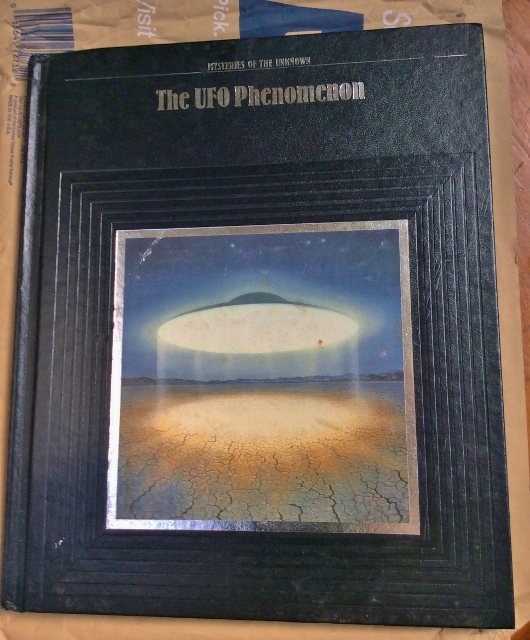 Like the one I received last week from a friend with a book on UFOs inside. 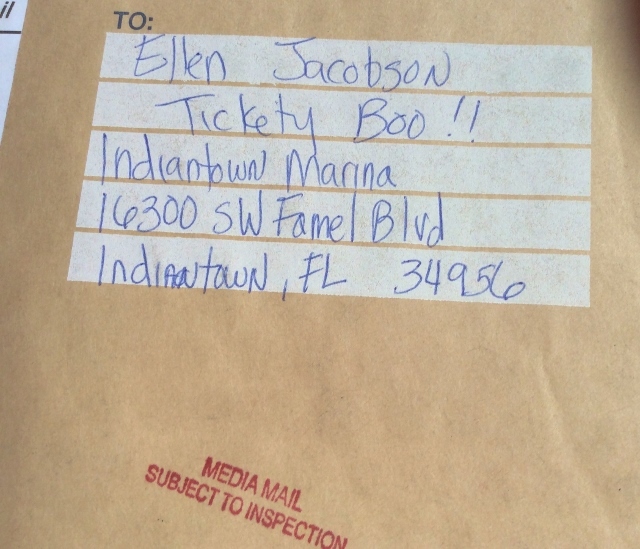 2 - Notice how there are two exclamation points after our boat name on the envelope? Punctuation can be fun. 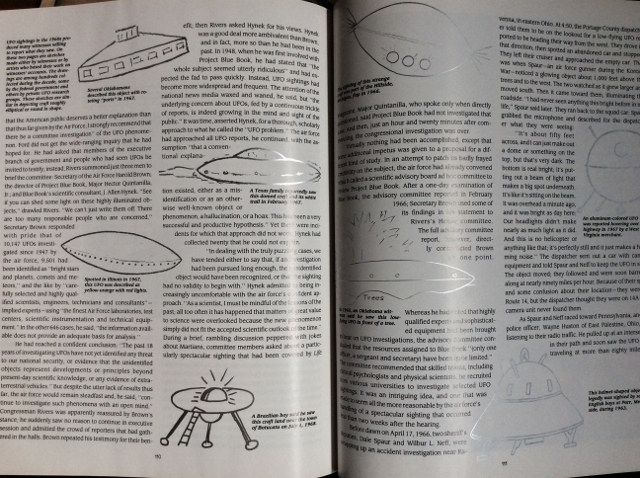 3 - UFOs come in all shapes and sizes, just like people. I imagine aliens come in all shapes and sizes too. I wonder if UFOs have really cramped seats like we have on our planes. Do all of the aliens jostle each other trying to be the first to board so there's still room left in the overhead bins for their carry-on luggage? I'm drinking iced coffee this morning while running my air conditioning full-blast. Yes, it's still hot in southern Florida even though it's mid-October. Looks like we're in for another real feel temp of over 100 today. When you start dripping sweat the minute you go outside, it's hard to get into the fall spirit. All everyone seems to be talking about on Facebook these days is pumpkin spice this and that while wrapped up in adorable sweaters and scarves. I don't really like pumpkin spice flavored things. I wonder if there's a support group for people like me? Everything seems to be pumpkin spiced these days. They probably even make pumpkin spice toilet paper. The annual migration of the snowbirds has kicked off. People are starting to head back to the marina to get their boats ready to head off to the Bahamas and beyond. We had our first Indiantown Party Posse get-together last night of the season. My friends brought delicious homemade treats to share. I let Walmart do my cooking for me. I really need to up my game when it comes to potlucks. I've got a lot of bug bites on me. I really should stop itching them, but I can't seem to help myself. I saw a giant black spider running across my bed last week and dive under the mattress. Man, that thing can move fast. Normally, I'm kind of okay with spiders, but it's possible this was a black widow and I'm not okay with having that share my bed with me. I haven't seen it in a while, so hopefully, it's found someplace new to live. In them meantime, I sleep with one eye open. The new marina cats are so adorable! I wonder if they would be interested in hunting down a spider. I borrowed a friend's dinghy yesterday to clean off the side of my boat. It looks so much better now that it's back to its original white color, rather than the green hue it had developed with all of the Florida mold growing on it. It will probably turn green again in a couple of days. I seem to know that names of all of the dogs at the marina, but I struggle to remember their humans' names. Why is that? Time for some more iced coffee. What did you think about over your morning cup of coffee, tea, or other beverage of choice? 1 - It's always a celebration at the marina when someone splashes their boat after working on it for ages in the boatyard. It's even more of a celebration when she floats. 2 - This adorable tugboat is our new neighbor. I love the little round window on the door. 3 - Her owner calls her Big Tow and his dinghy is fittingly named Little Tow. I'm a sucker for coupons. The irrational part of my brain screams, "It's a bargain! Get it! 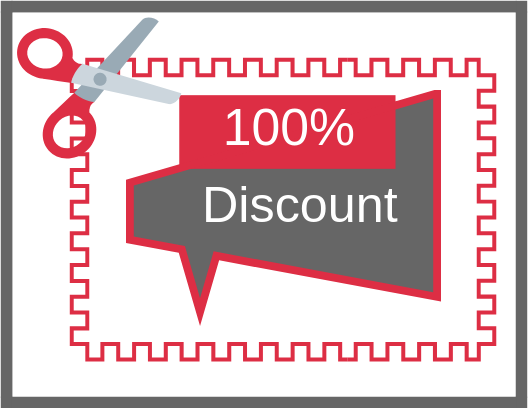 Use the coupon!" This is the same part of my brain that convinces me that having cookies for breakfast is a smart dietary choice. The more sensible part of my brain has been beaten into submission over the years and doesn't even bother to put up a fight anymore. 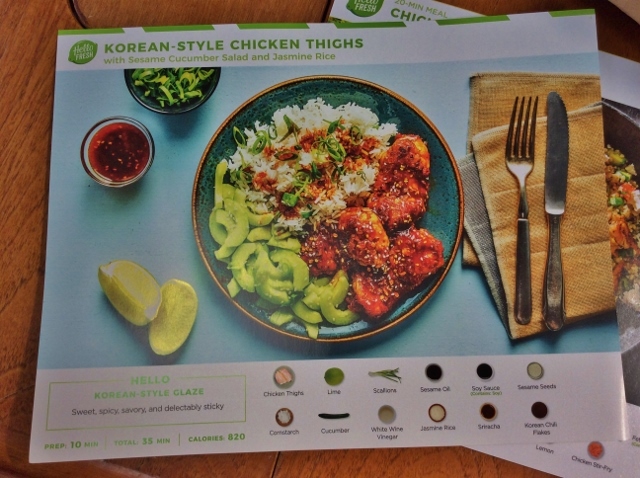 So when I got a coupon for a Hello Fresh meal kit, of course I ordered one, even though I knew it was probably a bit foolish. But, in my defense, I was curious what all the fuss is about. I also did a quick calculation and figured out that the cost of the meals (with the coupon, not at full price) was about what I'd spend on groceries, so it wasn't going to break the bank. I picked three meals (two servings each) - Korean-style chicken thighs, chicken over tabbouleh, and chicken cheddar fajitas. Because I don't have an oven, I was limited to meals that could be cooked on the stove-top. A few days later, my box arrived. Everything was well insulated with chill packs, but even so, in the heat we've been having, I'm not sure how long everything would have remained fresh if I hadn't picked it up right away. The packing materials are recyclable, but we don't have recycling facilities at our marina, so I ended up having to chuck everything out. I felt bad about that. I rummaged through each bag and pulled out the stuff that didn't need to be refrigerated. I imagine if you had a normal fridge, then you could just tuck each individual bag inside, keeping the meal ingredients neatly separated. My top-loading marine fridge doesn't have room for this sort of thing, so I just chucked everything into a communal bag and jammed it into an empty corner. As for the meals themselves, they were fine. The recipes are straightforward and easy to make. But because I make variations of the three meals I had chosen all the time, it wasn't too exciting. I can see the appeal of meal kits. When I was working crazy long hours, the thought of figuring out what to cook, going to the store, and then pulling it all together was overwhelming at times. Going out to eat, getting carry-out, or just having cookies for dinner was often the default. Something like this might be a solution for busy folks. It might also be a good way to experiment with new-to-you ingredients. 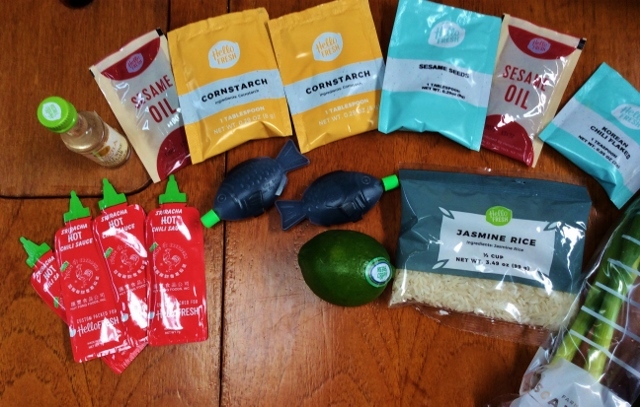 While none of the ones in my meal kit were new to me, I can see how it might be a good introduction for things like sriracha sauce or dukkah spice mix for some people. 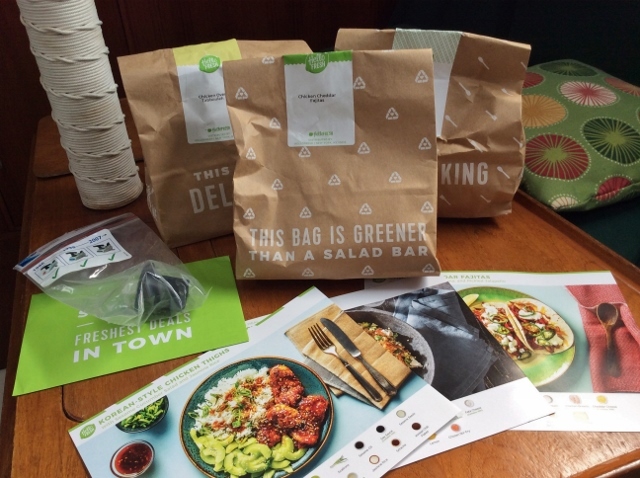 Would I buy another meal kit again? Nope. The regular price without a coupon is way too expensive for what you get. 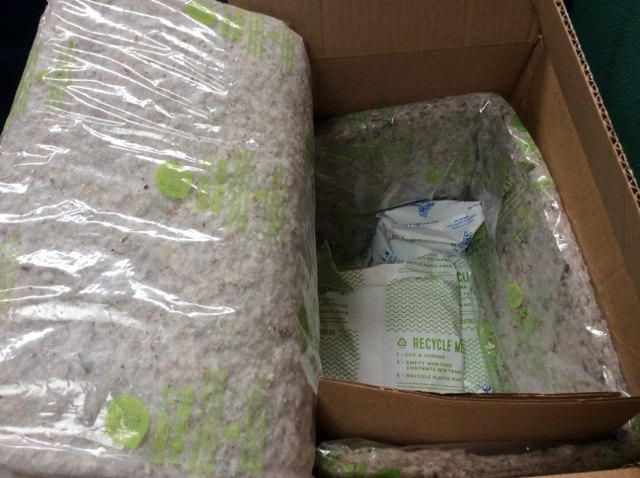 Plus there's the whole issue of not being able to recycle the packaging materials where I am. But as far as experiments go, this was an interesting and tasty one. What do you think about meal kits? Have you ever experimented with them? Here's an important question for you all - would you want a hairless cat? Personally, I think cats need fur, otherwise, what's the point? Have a look at the Spynx kittens in this video and let me know what you think. And now for a slightly harder question - are we living in a simulation? My mom sent me this article which posits that we're part of a simulation (think The Matrix). I've heard about this theory before and read a few sci-fi short stories based on this. 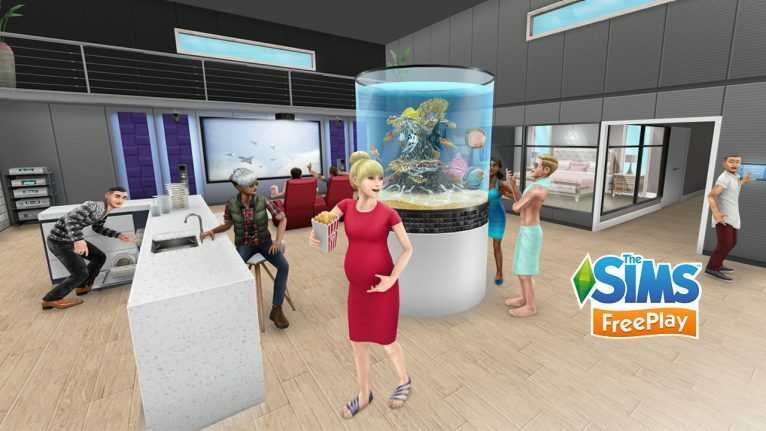 Frankly, it's all a bit depressing, so I distract myself from such scary thoughts by playing The Sims. I wonder if they know they're not real? Some of you may have seen Crystal Collier's post yesterday announcing that she's stepping away from her blog. While I'm sad to see her go, it's totally understandable that she needs to channel her energy toward her family at this point in her life. 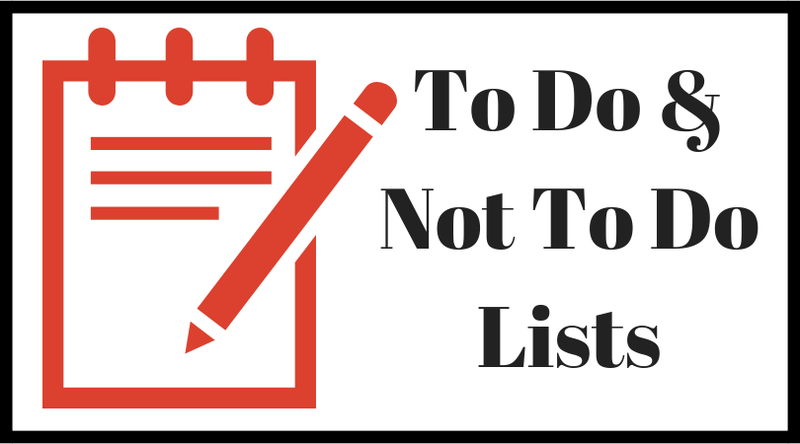 It reminded me that I should probably tell you about the change to my blogging schedule. 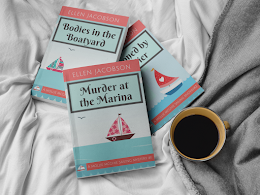 I've mentioned a couple of times that I haven't had the same energy for blogging as in the past, probably because I've been focusing more on writing my cozy mysteries. I still love blogging and am going to keep on with it, but I'm only going to commit to posting here on Mondays and Wednesdays going forward. I'll still do the occasional Friday and Saturday posts when the mood strikes (like today), but those won't be regular posting days. Do you like hairless cats? Do you think we're living in a simulation? "How do major life changes affect your writing? Has writing ever helped you through something?" "Here, kitty, kitty," I called out. I opened a can of cat food, scooped it into a bowl, and set it on the floor. "Come and get it." A streak of gray fur flew past me and skidded to a stop. Simon sniffed at the bowl then sat back on his haunches and glared at me. "This doesn't smell like Frisky Feline's Ocean's Delight, lady," he said. "That's because it isn't. It's a new brand of organic cat food especially designed for the, ahem, less active cat." "Less active cat?" Simon asked. "What are you talking about? I'm very active." "Moving from the bed to the couch for your afternoon nap isn't exactly what I would call active." I pointed at the bowl. "Go on, try it. The lady at the store said that the morsels of tuna and turkey nestled in a hearty beef gravy are sure to delight any feline's taste buds." Simon extended one of his large gray paws and tipped the bowl over, knocking the contents onto the floor. "My taste buds told me to tell you to take a hike, lady. A hike right back to the store to get some Ocean's Delight." 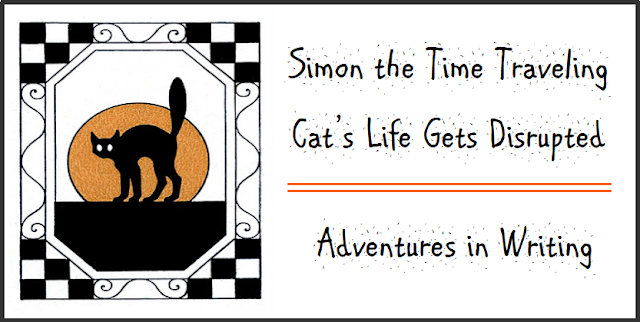 "Oh, Simon, you're going to have to learn to embrace change. I bought a case of these cans. It's this or nothing." "Fine," Simon said. "If it's change you want, how about if I start hacking up my hairballs on your pillow instead of on the carpet from now on. How does that sound?" He padded toward the bedroom, then turned and looked at me. "I feel one coming on." Fine," I said with a sigh. "I'll go to the store." "While you're at it, pick up some full-fat milk too, lady." When I first looked at this month's question, I figured it didn't apply to me as I didn't think I had had any major life changes since I started writing. Then I thought about it some more and realized that I actually started this whole blog as a result of a major life change - buying a sailboat, moving aboard, and setting off in search of adventures on the water. Duh! That's a pretty big change and the reason why I started writing in the first place. 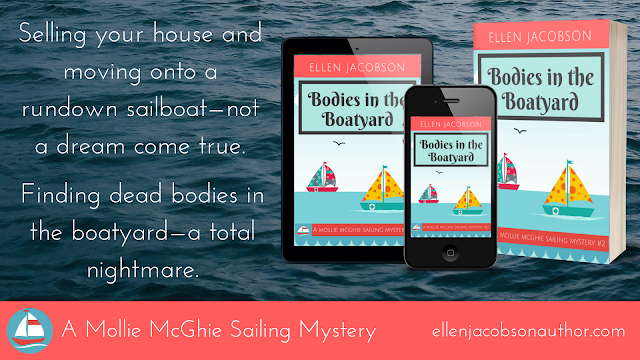 And my cozy mystery series is all about how the kooky Mollie McGhie copes with major changes in her life when her husband presents her with a dilapidated sailboat and tried to convince her to sail off into the sunset with him. So I guess writing is how I document and process the changes in my own life. In related news, I just got back >>Bodies in the Boatyard<< from the editor. I'm in the process of making changes before it goes back for a final round of edits. Hoping to release it in November (exact date TBD). Cross your fingers for me. And your toes. Plus your elbows if you're particularly dexterous. How have major life changes affected your creative pursuits? Clockwise from upper left: (1) Insect repellent - the essential centerpiece at any outdoor event in Florida; (2) Alex, one of the cool guys who works at the marina, sporting some patriotic shorts; (3) Visions of having three books in my cozy mystery series published; (4) Kudos to folks who brave the heat to clean their boats off - feel free to stop by and take care of mine; (5) I love that someone is driving a former police cruiser - very cool! ; and (6) Our friend, Ted, doing his best imitation of a peacock at the local Guatemalan-Mexican restaurant. September was hot, hot, hot. That's about all I remember from the past month - the heat. Everyone in northern climates is posting lovely autumnal pictures on Facebook. Cool, crisp air. Needing a sweater at night. Sipping on hot chocolate without breaking into a sweat. It all sounds so lovely. Instead, I spent pretty much the entire month inside my boat with the air conditioning running full blast. On the bright side, at least the great outdoors didn't tempt me away from my keyboard and I made some good progress on my writing projects. 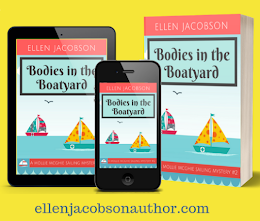 I sent >>Bodies in the Boatyard<< off to the editor mid-September (hoping for a November release) and started outlining book #3 in the series. 8 - How many bags of chips there were at the Labor Day potluck. You can never have enough chips. 3 - Number of new cats at the marina. So cute. 44 - How many scenes I've outlined in the third book in my cozy mystery series. This one is going to be called >>Poisoned by the Pier<<. Yep, you guessed it - someone is going to get murdered by way of poison. But it's also going to feature cake. Lots and lots of cake. $91.56 - How much I spent on eating out last month. Way more than I would normally spend. I gave into laziness way too much during September and ate out or got take-away instead of cooking at home. $1.06 - How much a container of mango juice costs at one of the local dollar stores. I love mixing a little of it with some sparkling water. Like a can of soda, but with far fewer calories. I find dollar stores a bit dangerous. "But this plastic dinosaur only costs a dollar! It wouldn't make sense to go home without it, would it?" 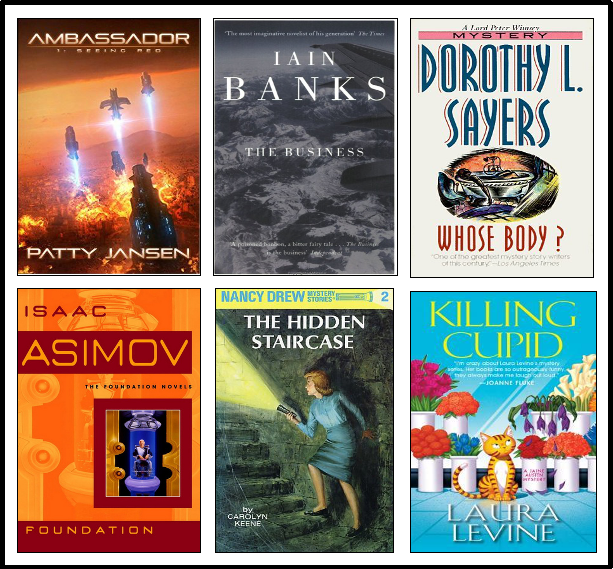 6 - How many books I read. Fewer books than I would have liked, but I'm still on target to meet my goal of a 100 books this year (currently at 83). My fave was Island of the Mad by Laurie King, featuring Sherlock Holmes and Mary Russell. 2 - Number of overdue library books I had. Tsk, tsk. 8 - How many inches in diameter the average pancake that I make is. Yes, I measured my pancakes. No, I don't measure how much syrup I put on top of them. I like a lot of syrup on my pancakes. It's probably better that I don't know exactly how much. 3 - How many seasons of The Mindy Project I've binge-watched. Who know that a show about an OB-GYN practice could be so hysterical? Now, going to the OB-GYN, not nearly as much fun. 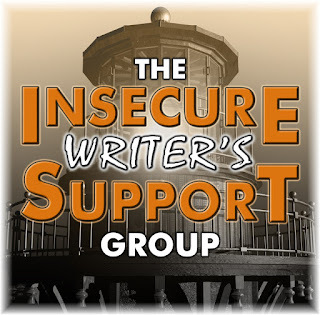 A Blogger Who Blogs or a Writer Who Writes?